My twitter section on my blog has gone ‘down’ so its showing not my posts. Ps – makerbot stepper mototr driver board chip has been removed (aswell as 2 tracks after they were incinerated) but will solder wire on to fix prob – uni are currently playing with the gerbers and are sorting out making new boards for makerbot, inc stepper boards from the gerber files – however the holes used are mny! 13 drill sizes in total! will @makerbot to let them know to change these sizes so that they can reduce tooling costs in manufacture! Oops guess i need to go to bed before i do anymore damage! Oops guess i need to go to bed before i do anymore damage!, originally uploaded by Roboteernat. Sep19_09, originally uploaded by Roboteernat. Sep17_02, originally uploaded by Roboteernat. PSU slot contains alot of stuff! PSU slot contains alot of stuff!, originally uploaded by Roboteernat. installed first opto, originally uploaded by Roboteernat. all opto sensors, originally uploaded by Roboteernat. working, originally uploaded by Roboteernat. 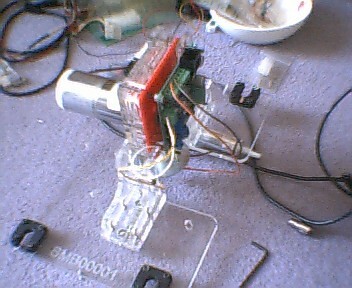 testing x axis sensor, originally uploaded by Roboteernat. and nothing… nada… something is not right here… multimeter!